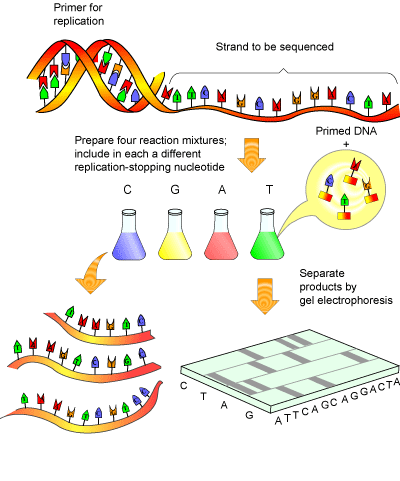 Conventional DNA sequencing uses dye-terminators: building blocks that can’t be extended, attached to a dye that is different for each base (A,G,C or T). That way the polymerase creates a mixture of strings of building blocks. Each string has a different size and ends in a terminator. Evolution has fine-tuned DNA polymerases’ ability to discriminate DNA building blocks (deoxyribonucleoside triphosphates) from RNA building blocks (ribonucleoside triphosphates), even though both types of building blocks are floating around in the cell. The right kinds of building blocks fit, and the wrong ones don’t. That means that any time scientists mess around “under the hood,” they’re messing with some sensitive machinery. A method called “reconstructing adaptive evolutionary paths”, developed by Gaucher, was key to identifying parts of the polymerase that could be changed without destroying its function.